Measurements: 2.4 x 4.75 inches; or 61 x 120 millimeters. Back of card: A stylized Egyptian figure of Ibis, a man with an ibis for a head. An ibis is a stork-like bird. This version has a green face & black hair. The rest of the body is nicely tanned. The background is light tan with some other hieroglyphic characters in the lower left corner. So you won't be able to invert these cards & surprise yourself. Booklet included: Yes, small, 75 pages. Written by Josef Machynka, translated by Mascha Rabben. Publisher: AGM, AGMueller. Printed in Switzerland. Comments: Cards are stylized with lavish use of Egyptian symbology & hieroglyphs, which makes me wish I could make more sense of them. 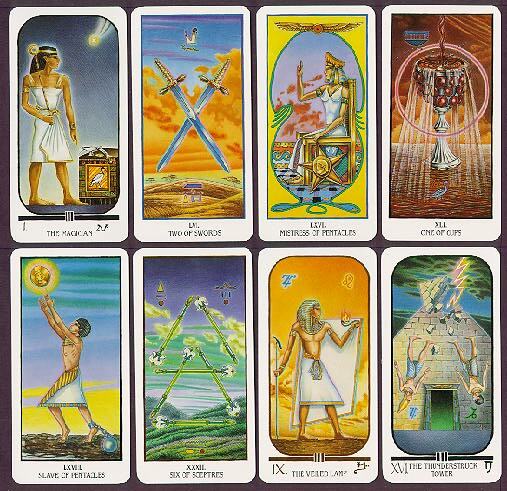 Many of the Major Arkana cards have unique names (Isis-Urania, Cubic Stone, Crocodile), others are Egyptian takeoffs of normal Major Arkana cards: Gate of the Sanctuary in place of High Priestess, The Victim in place of the Hanged Man, The Thunderstruck Tower (actually a Pyramid) in place of the Tower, etc. The court cards include Master, Mistress, Warrior & Slave. The Slave of Pentacles should make you uneasy: It's the pursuit of money in the sky by a man chained to the ground: Frustration.